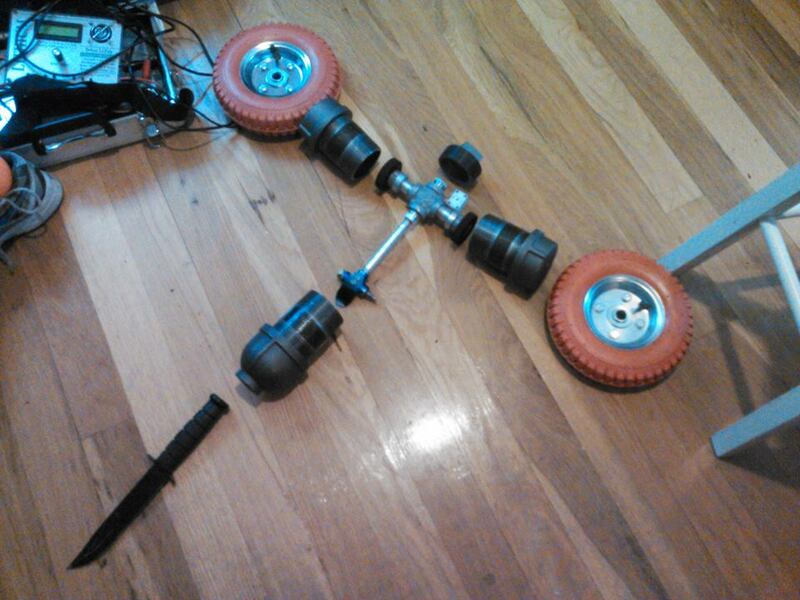 Some of you may have heard of my 1lb fighting robot, Satan’s Segway. I’ll put the details of the build in a later post, but after scoring an unbelievable 2nd place at 2015 Bot Blast, I decided to do the logical thing and scale it up to a weight class that would cost too much money and probably be utter junk in. Aluminum pipe gets swapped for black steel, spongy wheels for Hazard Fraughts, Silver Sparks for DeWalts. And the best part is? CAD says I make weight. Next up was sourcing all the bits. McMaster would be the easiest option, but I know better than that. Metropolitan Pipe Supply in Cambridge has every sort of pipe fitting you could ever imagine, and if they don’t have it they can tell you where to get it. Everything is NPT 2 1/2″ except for the weapon arm which is a more reasonable 1″. Machining was pretty straightforward on this guy. Starting with a stock DeWut gear box from Charles Guan’s Equals Zero Designs, I turned down the front plate to fit the 2.5″ ID of the pipe. Interrupted cuts with carbide are fun, but with the right speed and feed can still get a lovely finish. Early on, I decided that Charles’s rear motor holder/billet wouldn’t quite work for the compact nature of the Pipebot. So, I carefully and painstakingly machined an adapter ring out of some nylon I that was lying around. Only after I had 3 of the terrible made did I realize that there was a nylon-extruding 3d printer upstairs which could do a better job. The final result bolted together pretty well, and slipped right into the pipe fittings. This was my second time putting together a battery pack, and my first dealing with 18650s and soldering tabs together. 1/4″ wide copper braid for McMaster was used, as well as the Weller 80W MEGA IRON. If you ever need to solder battery packs or wire 14 gauge or bigger, I cannot recommend this stupid thing enough. Each of these packs was a separate 7S1P hexagonal pack. The plan was to pad the crap out of them with rubber and swap them out in case of a single failure. I made a total of 4 packs, and they worked very well in pairs. I did have a little bit of hassle with the balancing leads. My charger, the illustrious 1010B+ doesn’t have a 7S or larger plug on the balance lead. I used a pair of 4S leads and removed 2 leads from the second plug. This was a mistake, as every time I plugged it into the board, two of the leads immediately shorted to each other and melted. Taking a look at the board, the last lead of the first plug and the first lead of the second plug are connected, which shorts when you have those two leads going to either side of a cell. The right way to do it is to remove the last lead from each of the balance plugs, isolating that one cell. No serious damage was done, I’m glad I did this with the high-resistance 18650 cells instead of their “sparkier” 26650 cousins. Finally getting stuff together, you can see how tight the spacing is! As it started to come down to the deadline, my priorities got a little bit jumbled. I had all of the precision-machined components finished, but no total assembly, no wiring harness, and no weaponry. With the maturity of an 11 year-old, frosh-army at my back, and 6 hours until the drive to Philly, I set about making the wiring harness while John and Andrew threw together as many bad ideas for melee weapons as we had time. Here’s a good look at what I had only a few hours before take-off. With a 1″ pipe arbor, I could put pretty much anything I wanted on to the end as long as it had the 1″ NPT base. First up was my “Triggo” plan, which ended up losing the bottom board for weight. It’s a Kevlar-wrapped E6000 impregnated 2×4 board that skirts entanglement rules as close as I’m willing to go. The name of the game is play Sewer Snake with this and run into people until their brushless E-Penors burn up from stalling. Next up was the craptastical “bent 1000 times” sword donated by my lovely roommates. I’m not sure what the strategy was here, but what is the strategy with a pipe-bot anyway? Finally, a broom, to “sweep up” the competition. The plan was to use this to clean the arena between matches for an extra 5lb weight bonus, but I spent too much time repairing GP to actually use it. Other attachments include a forged-steel scraper for use as a wedge and a pickaxe for….reasons. I finished the wiring harness at 2 AM, threw everything John and Andrew had cooked up into the back of the ‘scoob, and rocketed off to Philly with Ian and Ciaran. Here I am, putting the whole thing together for the first time at 8:30, fifteen minutes before safety. The motor controllers, BotBitz 85A are a tight fit between the back of the two motor cans, but it works. The twin battery packs and wiring harness are an even tighter fit. Up to the chagrin of Dane, here I am shoving the batteries in with a rachet wrench. It might be a tight fit, BUT IT IS STILL A FIT. SHIP IT. #1. The pipe legs with the motors would ‘torque’ themselves free, tangle up the wires, and pull a few connectors out. #2. I was WELL beyond the discharge rates of the 18650s, even with them in 2P. I was also reaching the current limits of the BotBitz controllers and the DeWalts, which caused a massive thermal buildup inside of the tight quarters every time. #3. Every single weapon I had broke. 10/10, would pipe bot again. Next time? 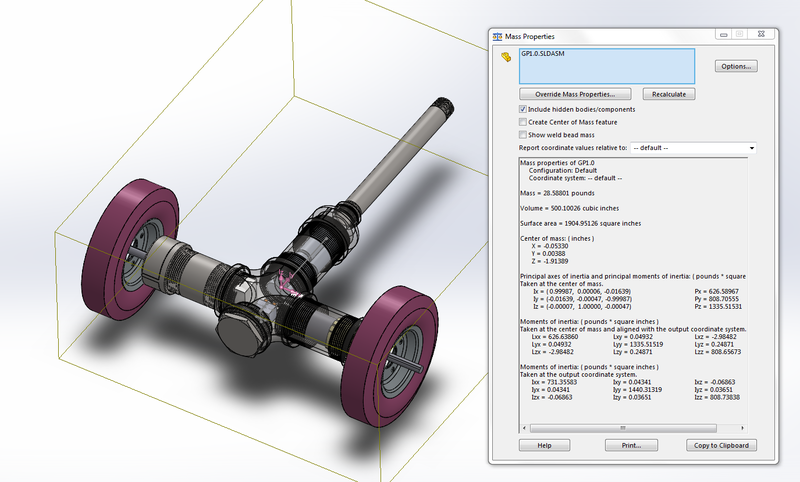 8″ pipes, twin E-Teks, and water-jet AR400 planetary gearboxes. ← Rage Frosh, Lost in Space, and Robots of MASSdestruction.